If you follow the still-expanding world of gospel hip-hop, you will know that there are now thousands of rappers flowing with messages about the Lord Jesus Christ. The Cross Rhythms radio stations are unusual in that we are prepared to insert independent gospel rappers onto our playlists, so alongside the Lecraes and NFs of this world you'll hear other rappers who've yet to step into the hip-hop big time and indeed may never do so. 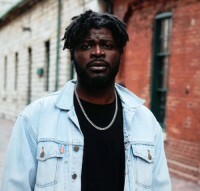 One rapper who has had Cross Rhythms radio exposure, with his hot tracks from 2014 "Mona Lisa (Be Mine)" and "Cinema", is Canada's Shopé. Since the release of the emcee's debut self-titled EP, which produced his radio hits, the Nigerian-Canadian rapper has gone on to big things in his homeland and is now on the cusp of stardom, winning Canada's yearly talent search, Searchlight, where thousands of hopefuls pitch for the big time. It was Shopé's impressive flows of his song "Come Wid It" which gained the rapper his award. Shopé will now receive a prestigious placement in the Allan Slaight Juno Master Class, five days of recording at Studio Bell, a performance at JunoFest at the 2020 Juno Awards in Saskatoon, and a performance at the 2019 CBC Music Festival in Toronto. In an interview he gave with Canada's top radio station, CBC, Shopé spoke about his long haul to the place where fame beckons. The first question he was asked was about his Nigerian roots. He said, "I was born in a city called Abeokuta, just outside of Lagos, Nigeria, however my family moved to Lagos before I was a year old, where I spent the first part of my life. So practically speaking, I'm from Lagos, Nigeria. I do have quite vivid memories of Nigeria. I remember our old house, the neighbourhood, the path I used to walk to my elementary school (we called it a 'primary' school), as well as the time I spent at boarding school. Music was a big part of my family life. I recall my parents had what at the time looked like a giant chest of vinyl records. I wonder if the chest would look as big, now that I'm older. In any case, they must have had hundreds of records ranging from African legend Fela Kuti to Earth, Wind & Fire to Michael Jackson to Sade and many, many more. My parents' love for music was evident not only in the record collection, but in the fact that something was often playing in the house or someone was singing. Not to mention the piano lessons I was forced to take, that I now regret quitting." CBC: What was the catalyst that caused your family to decide to move to Canada? How did that happen? Why here? Shopé: Although we were pretty well-to-do in Nigeria (upper-middle class), given the political and economic climate of the country, my dad wasn't sure of the prospect of his children's future. Nigeria is an amazing country but has had its share of issues post-independence in 1960. So my parents wanted to solidify a stable and prosperous future for their children. Also because both my parents had had the opportunity to travel, they had a global perspective and wanted their children to be global citizens. They understood the value of holding a Western citizenship and the advantages that would bring on the global stage. So they packed up everything, my dad said goodbye to a successful 30-plus year career and started all over again in Toronto. We landed in Canada because this great country opened up its doors to us. Honestly, we had initially tried the US but we were denied. Canada, however, being a place that openly embraces diversity, gave us a chance - something we have been incredibly grateful for ever since. In hindsight (especially given everything going on now), thank God we ended up in Canada. I wouldn't have it any other way. CBC: What did your parents do for work when they got here? Shopé: With respect to my parents' work, this is one of the primary reasons my dad is my greatest living role model. He left a lucrative HR career in Nigeria to work several low-income jobs. He was willing to do anything, anything (legal) to provide for his family, and he did such a great job at it. For a season, he was a salesman for a furniture company, then he did overnight security, then he worked for a financial services company, all the while pursuing his own side business ventures. Due to my mom's health, she wasn't able to hold a job for any length of time, so it all fell to my dad - and he WORKED! CBC: When did music become a major focus of your life? Shopé: It happened in the second year of my undergraduate studies at the University of Toronto. I had been dabbling with music and flirting with the idea of pursuing it for several years. I wasn't sure if it was worth abandoning the medical career my parents and I had planned out. But during a lecture in Con Hall (I forget the exact course), I had an epiphany. I had zoned out of whatever was being taught and was instead working on a song. In that moment, it hit me like a ton of bricks: 'Of course this is what I want to do with my life!' My love for music had been steadily growing for the past six years, as my desire for a medical career was equally waning. I still found the academic parts interesting (some of it at least), but not enough to work in it. The science didn't move me at the core of my heart the way the music did. At that point, in that lecture hall, I made the definitive decision to switch routes, to actively chase a music career after I finished my undergrad. Like a good African boy, I didn't drop out, but every spare moment I had from that point on was dedicated to honing my musical craft. CBC: Of the places you've already played around the world - USA, Africa, Europe - what is the most memorable and why? Shopé: It's hard to pick just one! It was a show in a city you may have never heard of before: Bielefeld, Germany. I had no clue I had fans in this city. But thanks to the internet I was performing to a room of about 150 people, all of whom were there to have a good time and who knew the words to my songs! I was blown away! If I may add another: a very close second is Paris! Of all the places I've visited, Paris is in my top three cities in the world. Paris was really special because a year prior to my show, while visiting on vacation, I told myself I wanted to play a show there, not having a single contact or knowledge of how it would happen. Long story short, a year later I was touring Europe and headlining a show in Paris. Wild! CBC: Which prize are you most excited about and why? Shopé: The Allan Slaight Juno Master Class. I've been dreaming about (and working towards) a long and prosperous music career for about a decade now. Over the years I have learned that while talent is indispensable, it takes much more than talent to succeed in the industry. It takes a great team and a certain business know-how, so I've been self-teaching, networking and knocking on every door I come across hoping I get my chance. The exposure from the CBC Music Festival as well as Junofest will be awesome, but the Allan Slaight Juno Master Class, I believe, will be the key that helps me harness all of that momentum and parlay that into a solid, long-term career. CBC: Finally, what does Shopé mean? Shopé: My name means 'make joy' in Yoruba, a language native to Nigeria. (There isn't a 'Nigerian' language. The national language is English, with many other ethnic languages.) 'Shopé' is a truncated and phonetically spelled version of my full first name, which is Mosopeoluwa.